I completely give credit for my decent verbal score on the SAT to my three years of Latin classes in high school. 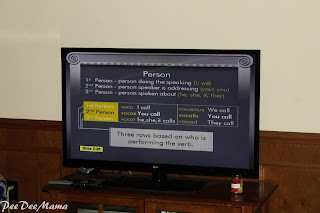 Because of the great foundation that Latin provided me, one of my goals for our homeschool is that each of my small people have some Latin education. Of course then I had the question: Which Latin curriculum should I use? When I was given the opportunity to review the Latina Christiana I Complete Set from Memoria Press, I anxiously awaited its arrival in my mailbox. Teacher Manual: This spiral-bound guide contains everything someone needs for teaching Latin I - teaching guidelines with suggestions for how to teach the different components of each lesson; drill forms that are reproducible for practicing vocabulary and conjugations; pronunciation rules; tests and quizzes with a test answer key; copies of the prayers, songs, and Latin sayings; and detailed lesson plans for each lesson. Student Book: This is a consumable workbook. Because I am using this with both Soccer Girl and Ballerina, I purchased a second workbook for only $16. Each lesson in the workbook consists of 2 pages. 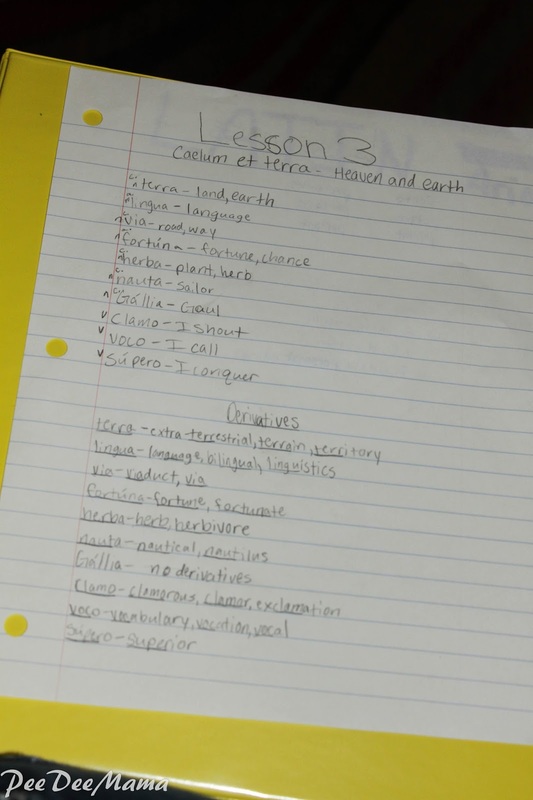 The first consists of the Latin saying, vocabulary, and grammar forms for that lesson. The 2nd page contains fill-in-the-blank exercises to practice the information learned in the lesson. Pronunciation CD: This contains all of the pronunciations for the sayings, blessings, and songs. It also goes over the pronunciations for each of the lessons. Instructional DVDs: This is a set of 5 DVDs containing video instruction of each lesson. Flashcards: These small cardstock flashcards contain the vocabulary for each lesson. Latina Christiana I consists of twenty-five lessons and five review lessons, which for us breaks down to one lesson a week. 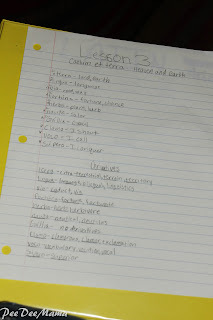 Students will learn approximately 200 Latin vocabulary words, 25 Latin sayings, 2 prayers, and 3 songs. They will also learn how to conjugate 1st and 2nd conjugation verbs and decline 1st and 2nd declension nouns and adjectives. One of the best features, in my opinion, is the focus on derivatives. 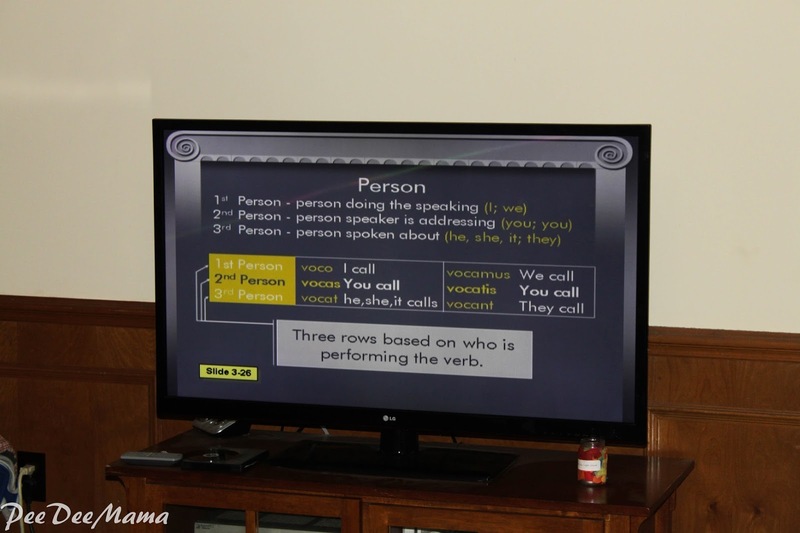 The lessons teach English words derived from the Latin words, having the students locate the Latin root in the English words and determining the definition using the Latin definition. Each exercise in the Student Book has a section where students fill in sentences using English derivatives. This is so important for developing a strong vocabulary. Since Soccer Girl struggles with vocabulary, I am hoping that this will be a huge benefit for her. Day One: The twins and I sat down and watched the lesson on the Instructional DVD. When the instructor did the recitation section, the girls and I practiced the recitations orally. It was like having our own private Latin tutor. I had the twins create a notebook, and for each lesson, they took notes on the lesson vocabulary, grammar forms, and derivatives. Day Two: The twins used the Pronunciation CD to practice the blessing, song, and lesson recitations. Day Three: The twins completed the exercises in the Student Workbook with me. It is important to me that they have good comprehension of the lesson vocabulary and grammar forms, so I went through the exercise pages with them - I asked the questions and they provided the answers orally before writing them in their workbook. Day Four: I ran copies of the reproducible quizzes from the Teacher Manual, and the twins completed the quizzes on their own. I said earlier that I was anxiously waiting to try out Latina Christiana I with Soccer Girl and Ballerina, and this curriculum definitely did not disappoint. The instructor on the Instructional DVDs is engaging and informative. Even if I had no Latin background, I could use this curriculum to teach Latin to my small people, especially with the Instructional DVDs. The pace of the lessons is ideal for my girls - not too much information at one time so they aren't completely overwhelmed, but enough content to learn that I feel it is challenging. The twins also both really like Latina Christiana I and aren't quite as nervous about learning Latin now.